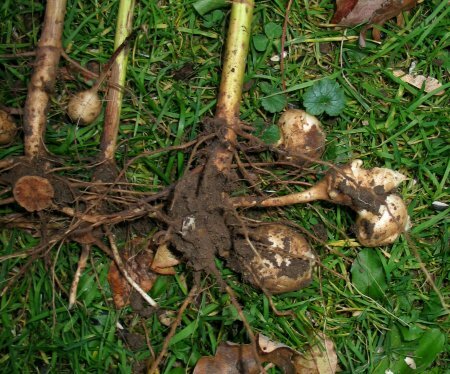 Jerusalem Artichokes have small tubers on the roots that are delicious. 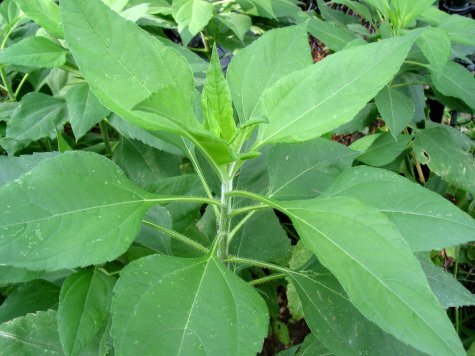 It is a native plant, with a very misleading name. It is not at all related to artichokes, nor does it grow in Jerusalem. A stand of Jerusalem Artichokes. These are in my backyard. Closer view of the growing top of the plant. Unfortunately I don't have any of my own pictures of them flowering. None of the plants I have grown have ever flowered! 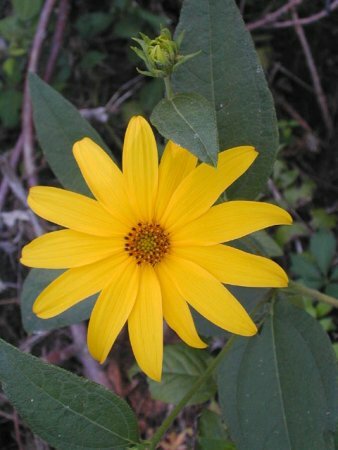 Please do not rely on photos of the flower to identify the plant. There are many plants with similar flowers! 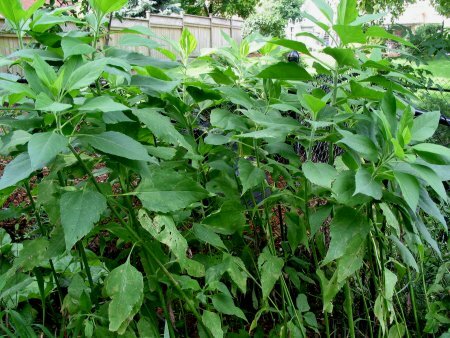 The only sure way to know this plant is by the tubers (see below). 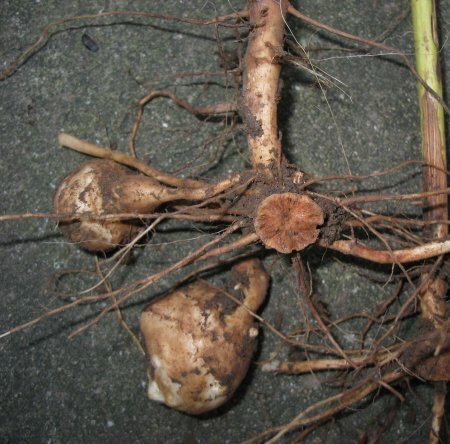 Here's a photo of the edible tubers, still attached to the plants. Another photo of the tubers. Note the distinctive circular disc at the end of the stem. Here is a handful of the edible tubers, washed and ready for cooking or eating raw. Cook them like potatoes, until they're soft. The skin can be eaten, or you can peel them. The insides are soft and mild tasting. Very good with salt and butter! They can also be eaten raw. These are actually small tubers. Normally they are much larger, and are much more lumpy. You used to be able to find them in certain grocery stores. But with the current trend towards decreased variety in stores, they are very hard to find. If you find any growing naturally, please harvest with care. They are no longer common. There are many similar plants. 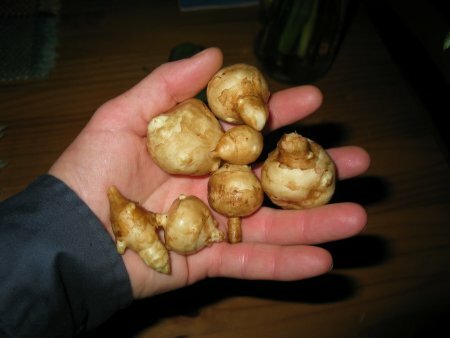 However, of all the similar ones, only Jerusalem Artichoke has tubers that look like this. 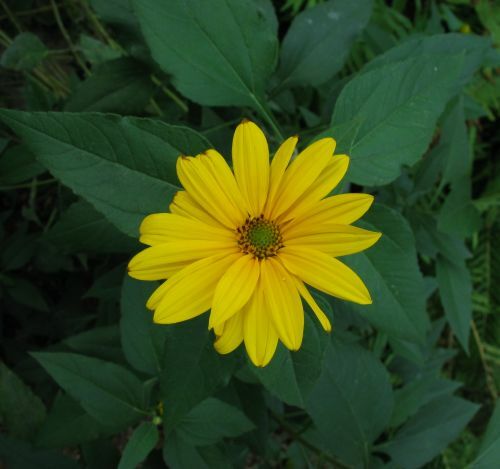 For example, this is **NOT** a Jerusalem Artichoke flower!